At the moment I have nor more time to develop this project. 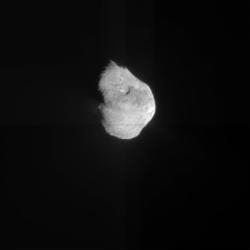 But there is a professional version of this project at NASA Deep Impact site an an information of an archive. This page of my website is in English to change information easier worldwide. My English isn't the best, but I think, readable. All other pages at my website are mostly in German. 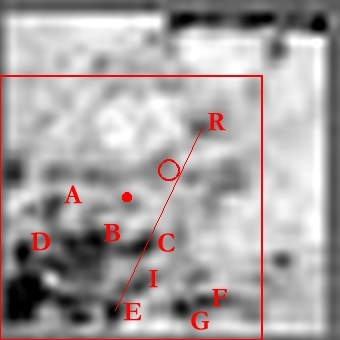 The map with aligned and combined images of the crash site region with the 18% of the scale of the last image. 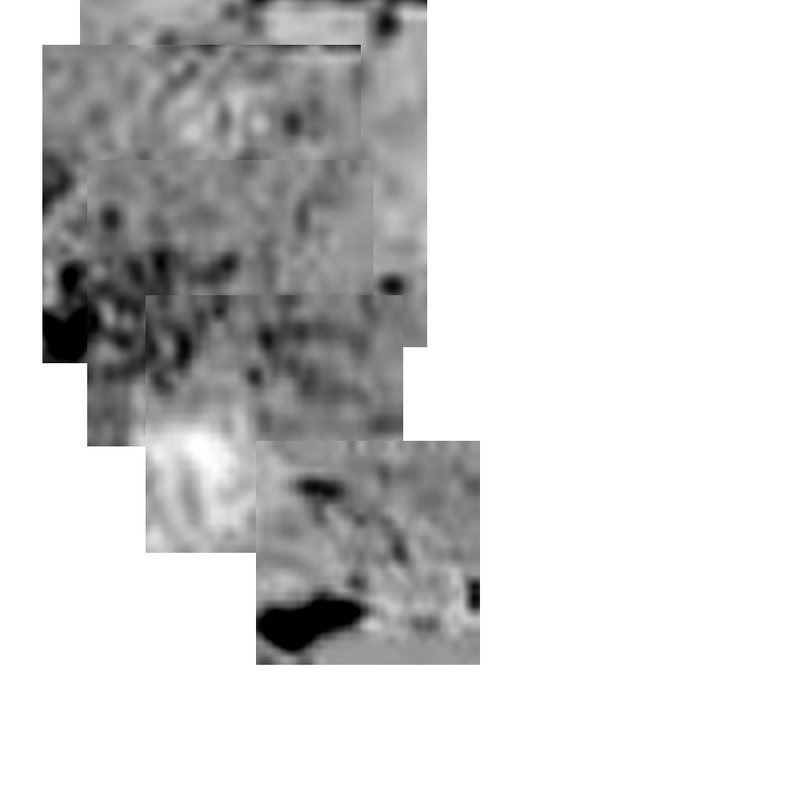 Click on the image for a map with 100% scale of the last image. The probe's impact of the Deep Impact NASA mission and the fast publishing of the pictures and other information (Blog by Daniel Fischer) led me to the decision to try to make a map of the crash "landing" area. 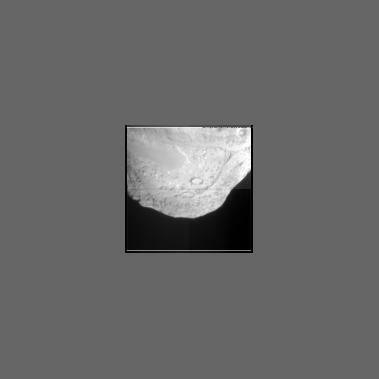 At first I used the Offline Explorer to make a local copy of all available images by the probe and the main satellite. After inspection of the file name, I realized that only the files with "web" and "its" in the file name are important for my project. So I copied them into a local folder. Unfortunately no value are given for distance or exposure data. 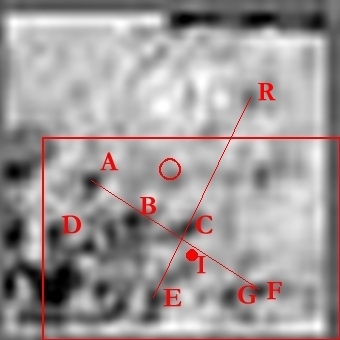 But the images are numbered upwards (with many missing numbers between the images). At first I take a look at the images. There are several image sizes. 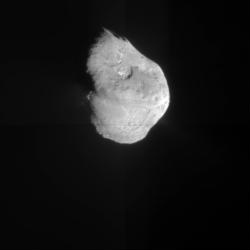 Because the slow image transimssion rate the impactor sent images with more and more less dimensions back to earth and the mothership. 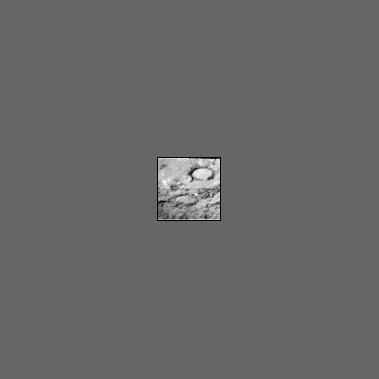 The pixel size starts with a search image 379x379 pixel width. This image has a quadrant brightness steps and shows only a point of comet or just some pixels. 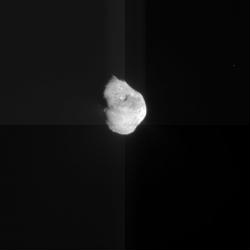 After that the image size changed to a full image comet and 250x250 pixel. 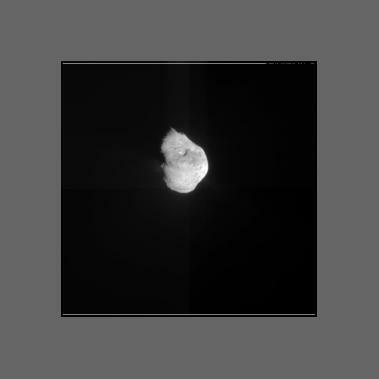 Then the pixel size was reduced to 122x122 pixel and the comet was only partially imaged. The next step was a 60x60 pixel comet-filled image.  At last the size was reduced to28x28 pixel. At the limb of each image there are also some pixel informations about transmission (like videotext). I reduced this image complete, but at the 28x28 pixel size sometimes a small portion comes into view. The images has the URL (e.g.) http://www.nasa.gov/images/content/121442main_ITSVIS-0467_web.jpg. The first six column number is a running number, which includes also preview images. ITS stand for the impactor probe. 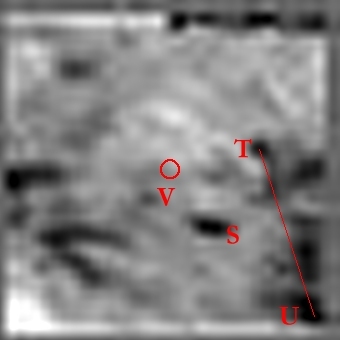 VIS for visual bandwith, I suppose. 0467 is a running number of the image itself. I use the last three numbers of the 6columns number for the "name" of the image – in the example above, my name is "442". My goal was a comet wide image, enlarged so much, that the scale of the large image is the original scale. 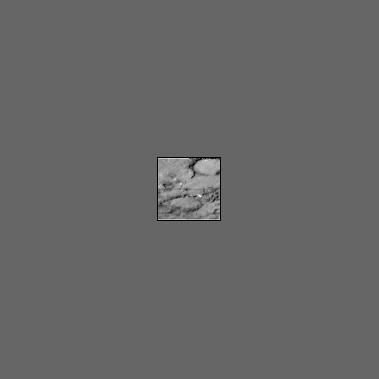 I started with the smallest images. 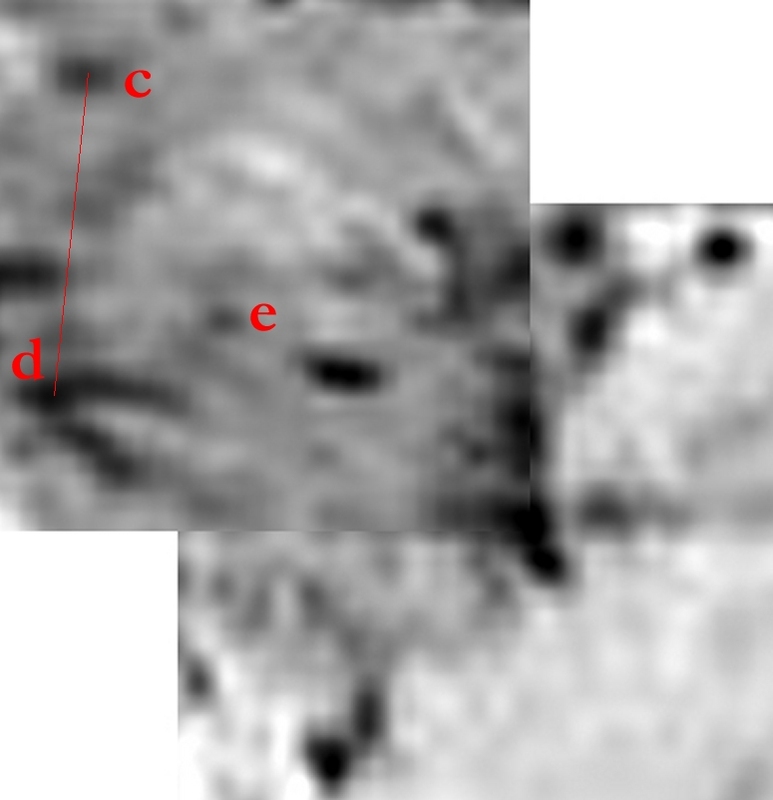 I enlarged them by a factor of 10 to identify details on two of them. 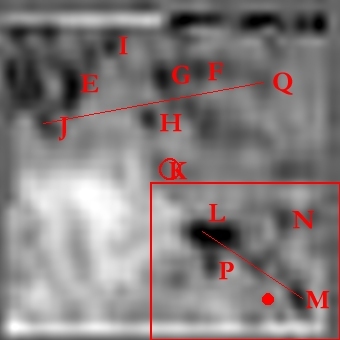 After inspecting the images, I give details on the images letters to identify them on the other images. 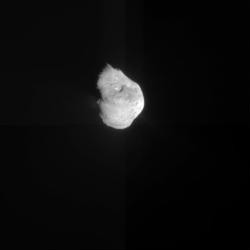 Then I marked the center of the image with an open red circle. 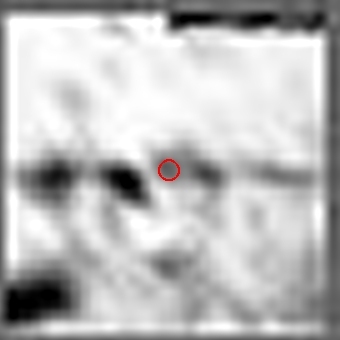 This center I marked on the next image with an closed red dot. 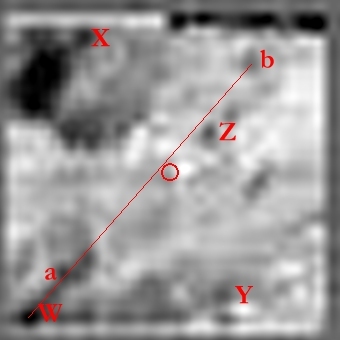 With a red rectangle I marked the approximate position of the following image in the current image. At last I measured lines between two points, which are visible on both images. 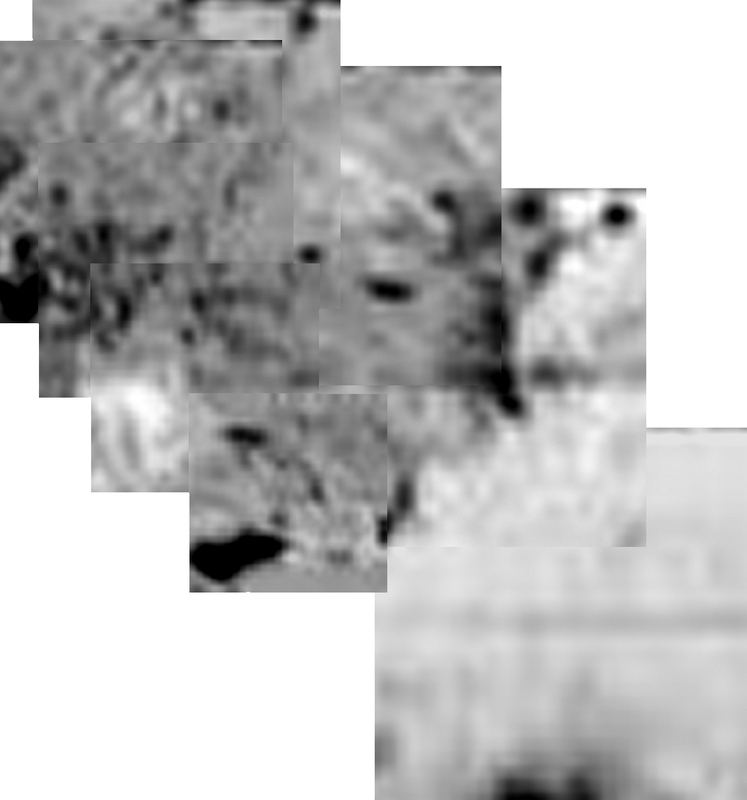 To combine the images I used the second and third last image 460 and 458 as start images (enlarged 10x) and calculated the magnification factors by comparing the line length between structures at the images. After this I copied the image with the higher number into the image with the lower number, so that the better exposed details does not vanished (freehand). Maybe in later times I will use exact pixel coordinates. If the brightness was different I made a brightness correction. Unfortunately there exists sometimes more and sometimes less severe brightness gradients, which are different from image to image. So brightness differences cannot be excluded until now. There seems only exposure times to exist, which are approximate 5-6% percent different in brightness. For the graphic work I use PaintShop Pro. The process was at begin easy, because only a magnification and a rising center distance was between following images, but no rotation. 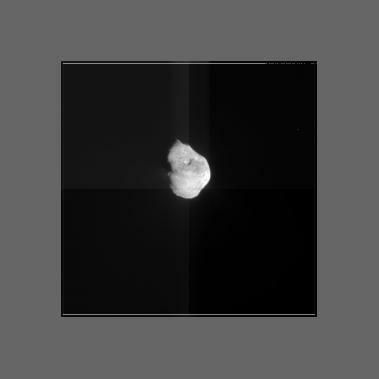 So I processed the first map with the four images 454 to 460. Then I have a stop with the images. But when I realized, that the image centers don't wandering linear, but on a curved trail, further aligning was not simple, but also not difficult. 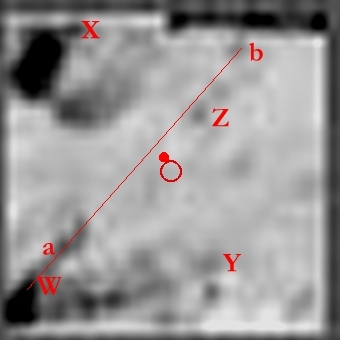 My experience from former years of identifying photographs or visual scetches in photographic star maps was very helpful! Processing the 5 images 452 to 460 and the image pairs 448-450 and 442-444 in maps was the next step. 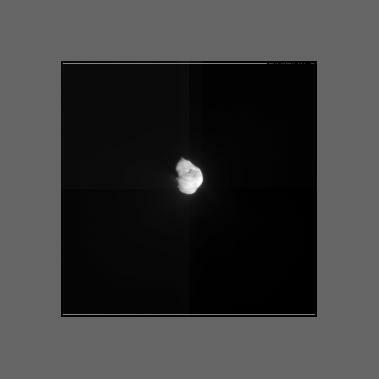 Now my image processing stops agin for a while. But after making the better resolution images unsharp, it was easy to combine the 7 images 448 to 460 in one map. 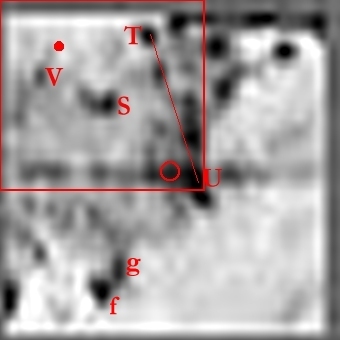 The image 446 resist aligning by spot identifactions. So I noticed the path of the center and the brightness variations on a very diffuse image version. 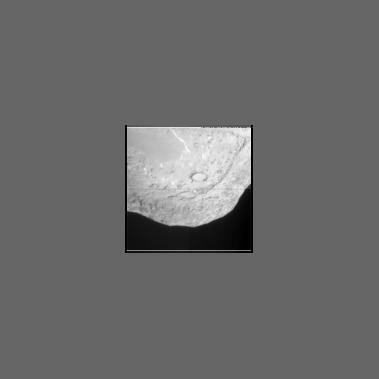 Then I could produce the map with the 8 images 446 to 460. 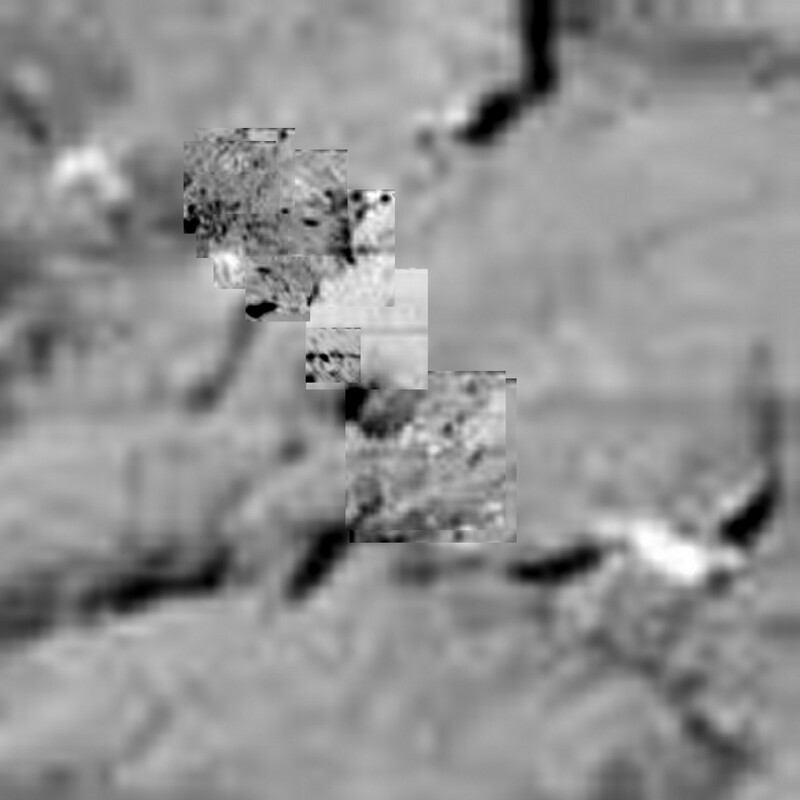 The last image 462 of the probe resisted also now an aligning on the map. 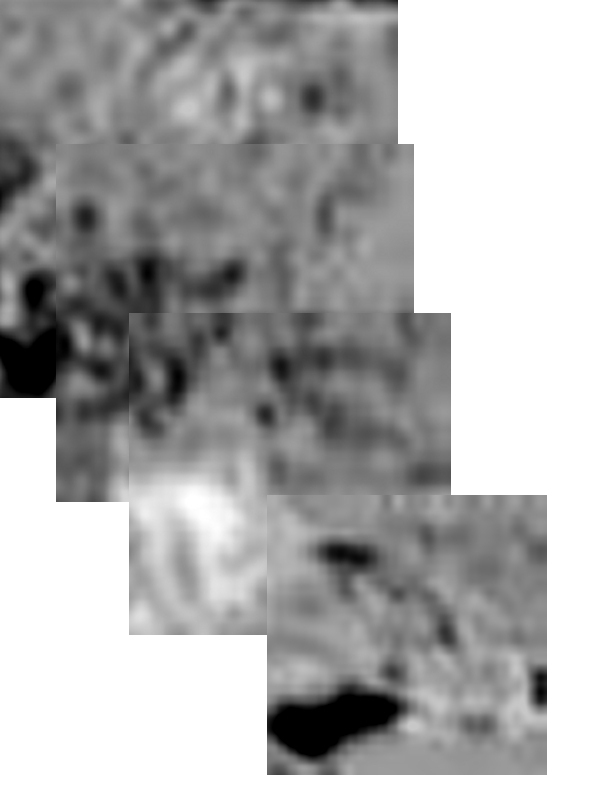 Unfortunately I noticed now, that I have some limb pattern on each image transferred to the mosaic. But it's only very slightly. In future I want to make an automatized mosaic, but that may last several weeks or months or longer. The next step was to take a look at the 60x60 pixel sized images. 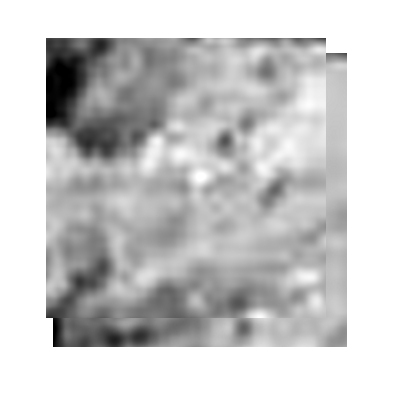 At first I didn't found any marks, which are present on the combined map and the last image 392 of the 60x60 pixel series. 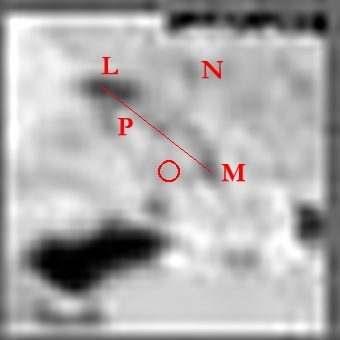 But after unsharping the map very much, I found the spots of the map also in the center of image 392. After copying the map into the image also the very last 28x28 pixel series image fall without problem into his position. 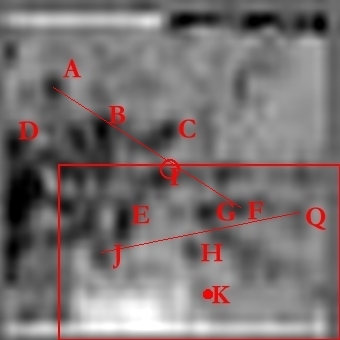 So the map with the 12 image 392 to 462 has been ready. I changed then the size also to 1x magnification of the last 462 image with result. The next steps will be added later at this site. My result may have not been made in a scientific manner, but just as a pattern recognition process. The picture center seems to run on a circled curve counterclockwise. The next process will be to processing all 122x122 pixel and so the end of the image marathon is near. 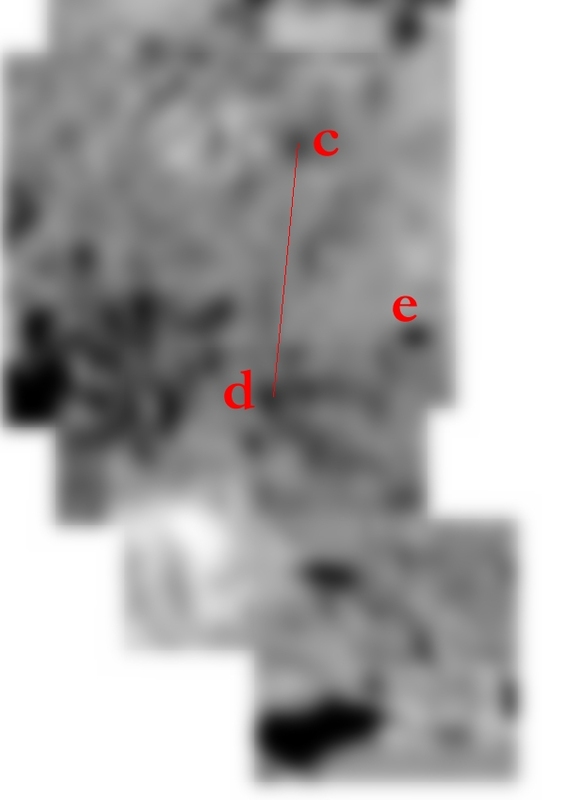 Click on image to see the image with measurements (only for the last row). Click on NASA to see the original image or take a look at all images. This tables are only for the very interested people and may only be understand by me. The corrections for the bigger images will be added later. 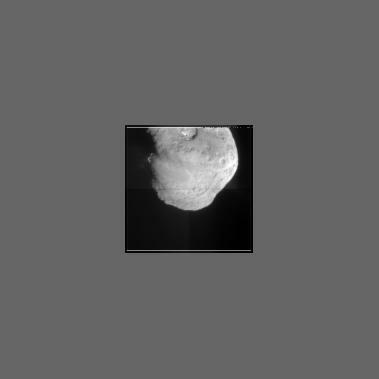 Images 462 and 460 has been aligned into the first map with the last 392 60x60 pixel image. 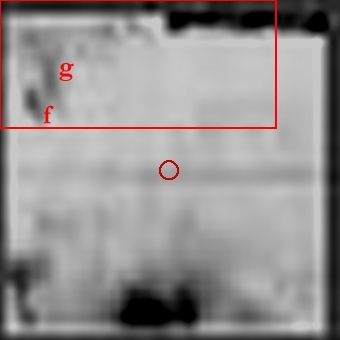 Images 448 and 446 can be aligned using points f and g. The scale cannot be determinded exactly. I took 110% or 230% relative to image 460. 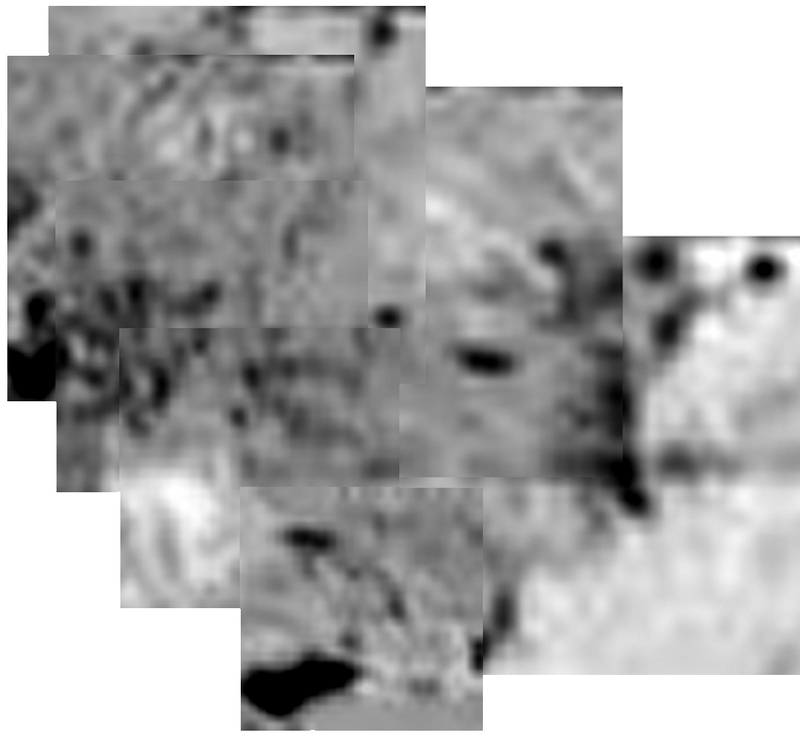 Images 446 and 444 has been aligned using 392 and identifying spots on the unsharped maps 442-444 and 446-460. 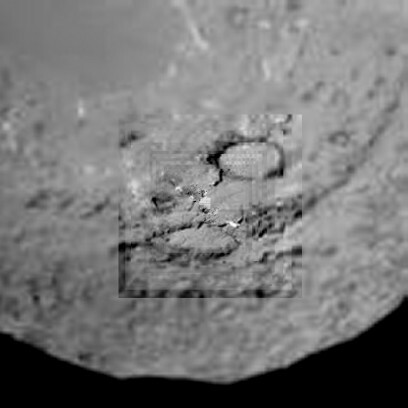 Notices: Picture is the short picture number, Points the used points, dx the x distance in pixels in the 10x enlarged image, dy the y distance in pixels in the 10x enlarged image, angle the angle in degrees clockwise from top in the image, d the distance in pixels in the 10x enlarged image, Mag is the magnification in percent from the current image to image in the line above, Bright is the brightness correction in percent from the current image to image in the line below and Note is a note. 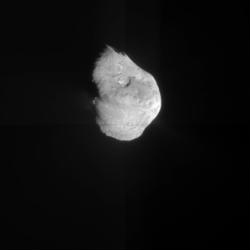 All images are copyright by NASA. The constructed maps are free of charge to distribute, if the image is accompanied by my name Jost Jahn or my website URL jostjahn.de and a short e-mail notice should be send to webmaster@jostjahn.de. If you distribute the map in a pyhsical media, you should send me an issue of this media. Send it to "Jost Jahn, Bahnhofstr. 12, 29525 Uelzen, Germany".